Once upon a time the world became populated by demons. Eating, eating. Fill me! Fill me! I am the Goddess of No More! I, I am the eater, fool. Maybe I just feel like dancing. When the Hindu Gods could not defeat a plague of demons, they called at last upon Kali. 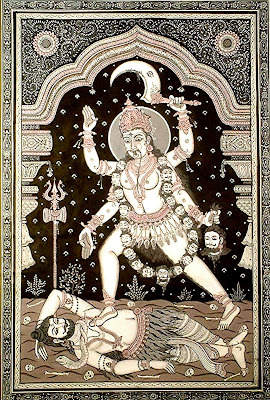 Severed heads adorn Her necklace, Her skin is black as night, and Her tongue protrudes from Her black face with the bloodlust of battle, and the immense laughter of Kali, destroyer of illusion, who sees beyond all appearances. Kali's dance is the destruction that must occur for each new beginning. Kali's love is tough love; yet the dancing feet and the flaming sword of Kali are among the most powerful expressions of Divine Love. I wanted to create a performance for Kali. As I drove to the event, I brought a costume, and snake with me, thinking the snake represented the serpentine energy of the kundalini. But I didn't know what to do. I went on stage, and read a paper, I just let the mundane despair come out. "I can't stand it!" 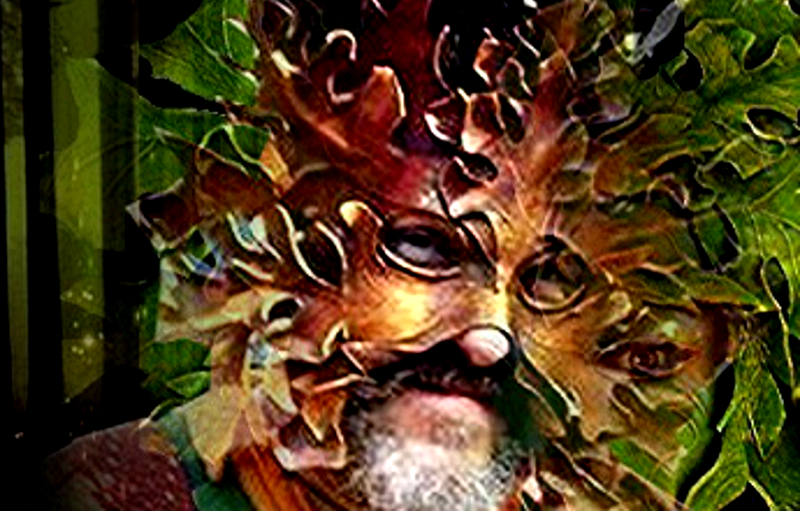 I said, and then I turned my back to the audience, just breathing, and whispered, "When I meditate, sometimes I become a Goddess......." Then I put on the mask. And a hot, hot energy seemed to rip through me. I turned around, and words fell out of my mouth. As I picked up the snake, I remember saying, "This is the Kundalini, this is the serpent." I spoke about how we channel that enormous energy into sexuality, but we don't understand that it can rise further into our hearts, our vision centers, infusing our entire being. All of this was spontaneous! I genuinely can't say it was I, Drissana, who did it. When I went into the dressing room later, I was shaking. It was as if Kali had left, and I was just this small, exhausted person, who for a moment had been inhabited by that ferocious intelligence. Kali is the surgeon. She cuts away what has to go. I ask for that quality when I have to cut something out of my life; an addiction, or a relationship that no longer is about growth. And I ask it be done precisely, this cutting away of dis-ease, malignancy, the aspects that no longer serve. Kali was the last resort savior. When the Gods couldn't kill the demonic forces that ravaged the Earth, they called on a woman's wrath. We all have the ability to call the Goddesses into ourselves. I can do this in my dance, but in everyday life it's more difficult. That's why I thrive on performance, because I can freely let those forces work through me. What I forget is that we can call on them at other times. We've forgotten that the Goddess dwells within us, all the time, and not just when we wear a mask, or are in workshop, or a ritual. We are, in Tantric terms, extensions or emanations of the Gods and Goddesses - we are their material aspects. We're not bodies that are seeking the spirit, we're spirits that are seeking bodily experiences. Remembering is a devotional practice. In the Hindu tradition, everyone has a deity they focus on as their personal deity. In the West, as we begin to reclaim the Goddess for spiritual practice, we each need to create a relationship with the Goddess form we have chosen, in order to manifest what we need for spiritual and emotional growth, to invoke the help we need. That practice is not just cerebral. We function out of our whole self, our bodies and spirits. The body-mind. That is where we re-member, we communicate with the Goddess within ourselves. Women need to become angry. Now. About the women of Afghanistan, the meaningless wars, the destruction of our environment. The demons of insatiable lust are devouring our planet. Those souls who await the future are being denied their birthright. Kali is the catalyst for saying "No more". She's the voice of women whose voices aren't being heard, women who need to open their mouths and speak for the first time. It's time to embrace the sword of Kali and start cutting away the delusions that are destroying our world. This is the ferocious mother who says "get away from my children, or I'll kill you." Mothers today aren't saying that. They're giving their children away. Giving them away to war, giving them away by allowing our environment to be depleted, giving permission to the powers that be to destroy their future. This time of change is the dance of Kali. The Kali mask embodies her spirit of "never again." Never again will women take abuse and do nothing about it. Never again will the voice of women will be silenced. Kali stands for us now. So She does. She is the voice of No More.